Both, a greenhouse and a polytunnel, are used for growing crops and flowers. People usually hesitate which one to choose as both structures serve the same purpose. To make the right choice, buyers should know the difference between a greenhouse and a polytunnel. One of the most common questions people ask is how to prepare the ground for a polytunnel or a greenhouse. Yet, there are several factors, such as ventilation, heat retention, etc. to pay attention to, as well. They play a major role when deciding which structure suits your requirements better. Paving slabs base – They allow you to plant crops and flowers only into pots. Compacted soil base – You can plant your crops directly into the ground. Compacted soil and paving slabs base – It allows you to plant both in the soil and in containers. People consider paving slabs to be the best base for a greenhouse. It helps prevent damp build-up and fungal problems, as well as diseases that uncovered soil can develop. Both types of structures should face North-South to avoid direct sunlight. Most of the plants may dry out if a change in temperature occurs. Polytunnels offer a much better control over its air circulation. Large doors at both ends provide sufficient air flow through the tunnel. Greenhouses provide ventilation through an opening on the roof, the door and side vents. Keep all doors and vents open during sunny days to achieve effective ventilation. When it comes to longevity, there isn’t much of a difference between greenhouses and polytunnels. Both types can last for many years. Polytunnels can last between 15-20 years but the covers need to be replaced every few years. A common question asked is “How long does a polytunnel cover last?”. Well, this will depend on where you’ve positioned the polytunnel structure. The plastic covers need a little care, too so you can ensure that they stay in good condition for a few years. Place your polytunnel on a spot, protected from strong winds. Clean the covers regularly from fallen leaves and trim nearby foliage. This will keep your polytunnels in good condition for longer. Scrub the windows to let more sunlight in. Frequently check and maintain the heating system components. Clean the floors and tables regularly. Let ladybugs and spiders in to control pests. Greenhouses can be the highlight of any garden, especially if they have a fancy design. They come in various shapes and models that you can choose from. 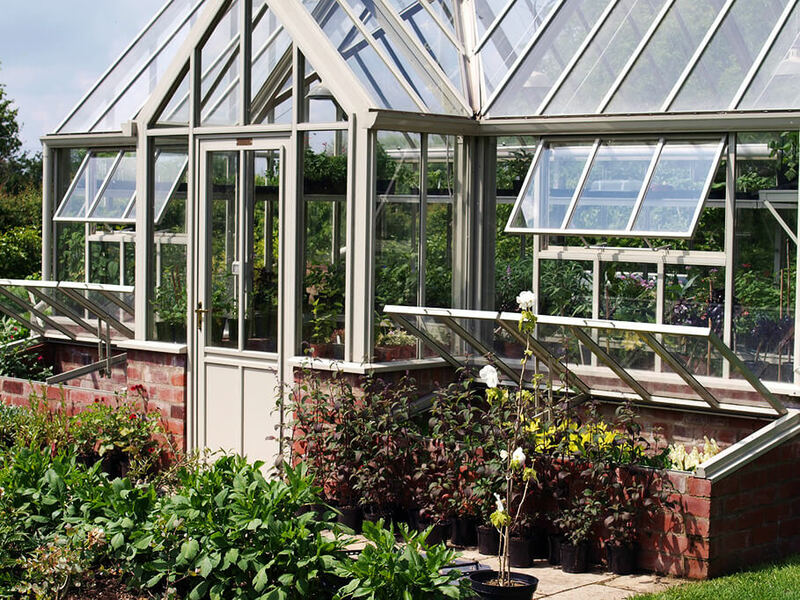 Orangeries, Dwarf Wall or Victorian Style greenhouses are the most popular designs on the market. Polytunnels, however, are a far more practical option but not so appealing. They can also come in various shapes, forms and sizes – each of them – with their own benefits. For instance, semi-circular arc-shaped polytunnels allow the rain to run easily off the surface. High-tent polytunnels, on the other hand, allow taller plants, such as tomatoes, to grow as high as they need. These constructions protect crops from bad weather conditions. They create a pleasant environment by retaining heat and moisture. The plastic sheeting that polytunnels use also affects heat retention. Note that green polytunnel covers do not let enough light permeate through the tunnel. This makes transparent covers a much better option. Condensation issues in polytunnels can be resolved by installing Thermal Anti-Fog covers, which effectively reduce moisture levels. This type of sheeting can also improve heat retention. Greenhouses offer maximum heat retention and better light transmission. But they are vulnerable to overheating, which is why plants need more shading. There are several ways to achieve that. Some people paint some of the glass panels to reduce the quantity of light coming through the structure. Fitting partially your greenhouse with external blinds will also have a similar cooling effect. The fixtures effectively prevent the sun’s rays from passing through the glass. Internal blinds, on the other hand, stimulate heat generation as the sun passes through the glass. Furthermore, it is important to make the right choice, regarding the type of glass you want to use for glazing your greenhouse. Buying toughened glass is a safer option because it breaks into blunt cubes. It is a bit more expensive than regular glass. In contrast, polycarbonate provides better insulation but it is likely to blow out of the frame in strong wind. Specialised equipment controls the temperature, humidity, air flow and irrigation systems. Polytunnels are prone to drought and so are greenhouses. You might need to add an extra layer of bubble insulation to protect your plants better in cold weather. Water collection is an important factor to keep in mind. Rainwater harvesting has many benefits. It is an eco-friendly process, a money saver and a nutrients supplier. Greenhouses are easier to adapt than polytunnels, with regards to fitting them with an effective rainwater harvest system. Well, a good solution to the water collection problem in polytunnels is using a gutter system. You can install a rainwater gutter to one of the sides of your polytunnel, leading straight into a water tank. This way, you’ll have sufficient quantity of irrigation water that you can use whenever you need to. What can you grow in a polytunnel and a greenhouse? Strawberries – Mix in some compost with the soil before you plant them. Raspberries – Add mulch to the soil to keep it moisturised. Melons – They like humid conditions and fertilised soil. Tomatoes – Boost the soil by adding organic matter to it before planting. Cucumbers – Create vertical structure in order to allow the crops to grow. Artichokes – They thrive well thanks to the warmth and humidity that polytunnels create. Rosemary – It grows well in warm conditions and does not need frequent watering. Oregano – It helps soil moisture retention. Basil, Thyme, Chives – They repel various pests and protect the crops around them. Peach – Polytunnels protect them from frost and birds that like their fruits. Apricot – They need some extra heating. Citrus (Lemon, Orange, Lime, Grapefruit) – Polytunnels retain the ideal temperature for them to thrive in the winter months. Tulips, Sweet Peas, Foxgloves, Lupins – They attract bees, pollinators and other beneficial insects. Roses – They need enough moisture and around 6 hours of direct sunlight per day. Tulips – These plants need protection against pests and frost, so this is the perfect environment for them. Orchids – Provide them with the right temperature. Avoid over-watering them. Lupin – Constant sunlight and moisturised soil is what they need. Lupins can grow in most soils, even those that are poor in nutrients, except in chalky soil. French Beans – A sunny spot and moisture is all they need. Aubergines – Warm the soil a couple of weeks before planting to protect them against frost. Peppers – Water and fertilise them regularly. Place peppers in a sheltered, sunny spot. Grapes – Water them frequently during the growing period. Kiwi Fruits – They should be grown in sheltered sunny spots. Crop options are limitless. Both types of facilities create appropriate conditions for crop growing. Polytunnels are usually used for growing large amounts of fruits and vegetables. On the other hand, greenhouses are better-looking structures. They are often used for growing various classic or exotic flowers or even tropical fruit. Polytunnels are a budget-friendly option. They can offer more growing space. Polytunnels are more flexible structures. They can be modified to incorporate various additional features or to achieve a specific purpose, such as widening the doors or expanding the plant beds. There is a possibility to increase the interior space. They can be blown away by strong winds, which is why the frame should be attached to the ground properly. Polytunnels are prone to damage, caused by pets and birds. If the sheeting is not straight and tightened properly, condensation can build up and harm the plants, as high humidity levels promote mould growth. Covers need to be replaced every 5 years. They are harder to fit with a rainwater collection system. Greenhouses are more visually appealing constructions. They are mainly used for growing flowers but you can grow crops in them as well. Most frames are made from powder coated aluminium, which protects them from oxidising. They protect plants better against pests. If you use toughened glass, they can withstand bad weather conditions, too. Site preparation requires a lot of effort. The base must be firm and flat. It can take up to several months to get your custom-made greenhouse delivered to you. Unless you want to buy a standard-size one. Greenhouses are more complex structures. It takes professionals a couple of days to install one. They are expensive and difficult to move as well. If damaged, you’re likely to be looking at replacing several glass panels. Since most people prefer to position their greenhouse next to the house, there isn’t always enough space to install it. Apart from the construction itself, supplying kits and electric heaters are not cheap, either. Before you make a decision, take your time to plan and define your needs. Both structures come in various shapes and sizes. Greenhouses are appropriate for you if you want something extra appealing for your garden. They create optimal environment for various exotic plants. On the other hand, polytunnels are something you might not want to place next to your house but in the backyard instead. Being easily expandable makes them appropriate for growing large quantities of edible plants and start up various flowers from seeds. They are more flexible and are the less expensive option, too. Did you know why are greenhouses called ‘green’? Greenhouses are eco-friendly structures which reduce energy bills. They are also good for the environment. They improve the air around your house. A common question asked is ‘Why are greenhouses called green when they are invariably clear glass or plastic’. According to some studies, greenhouses are called this way because they used to be treated with a green dye. It absorbed light and produced heat. In fact, people still use it today in salt production. It increases the absorption of UV lights by the sea in order to speed up evaporation. Greenhouse sheeting is usually made from translucent materials – clear plastic or glass. This allows sunlight to come in and stimulate the photosynthesis process. It combines carbon dioxide and sunlight’s energy which feed the plants. Around 6 hours of daily sunlight exposure is what plants need thoroughly. Do I need planning permission for a polytunnel? Polytunnels that are used for domestic purposes are known as ‘permitted developments’. However, there are regulations that should be followed. Keep in mind that commercial polytunnels are not considered as ‘permitted developments’. The structure should be within a certain height, position, size, movability, etc. A local planning authority can decide if you need planning permission for a greenhouse or a polytunnel. You can find some additional information on Planning Portal. Don’t hesitate to contact your local council office to get some more information in details. Or, you can always find your answers online. Did you find this article helpful and worth sharing? Or do you have any other interesting ideas on how to improve your front garden look? Then, please, tell us about them in the comment box below!